East Bay Center for the Performing Arts is an artistic and cultural resource for the low-income, ethnically diverse city of Richmond. The organization provides in-school and after-school education programs for 6,000 pre-K through middle school students in the greater Richmond area, as well as rigorous conservatory level training and wrap-around services for 140 middle and high school students at its beautifully restored facility in downtown Richmond. It reaches another 20,000 people through community events and public performances, all of which reflect a broad array of global art forms. Renewed funding will support the Center’s goals to achieve modest and sustainable growth in its programs and staff in order to meet continued demand for its services. East Bay Center for the Performing Arts is the primary artistic and cultural resource for the low-income, ethnically-diverse community of Richmond. 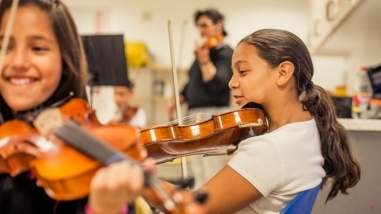 The organization provides conservatory level training programs, arts education opportunities, artful community health programs, and public performances for more than 33,000 people each year. 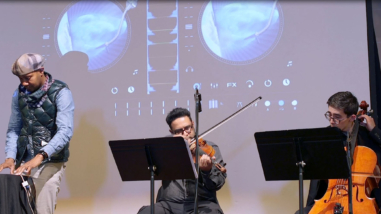 Its rigorous programs reflect an array of art forms that are most significant to the populations it serves, 75 percent of whom are under the age of eighteen. Renewed funding would support the Center’s goals to achieve modest and sustainable growth in order to meet continued demand for its programs since returning to the historic Winters Building following a $16 million capital renovation in 2011.